Our continued involvement both here in California and across the country is critical for building on the success of the Campaign and helping to raise awareness about this troubling disparity and the importance of reading to children. The beloved children's classic -- the story of the teddy bear Corduroy -- took center stage last week as California's children and volunteers from the education publishing company Pearson joined readers of all ages to make history in Jumpstart's third annual Read for the Record®. The Campaign created the world's largest shared reading experience, while breaking the record for the number of people reading the same book on the same day all across America. With entries still being tabulated today from all 50 states, California's more than 100,000 participants have helped set a new world reading record as adults and children shared together the adventures of Corduroy, the little brown bear with one button missing from his green overalls. The sponsor of Read for the Record events across California, Pearson, the country's leading publisher of school educational materials, employs 1,000 people across the state, and helped to raise more than $1.5 million nationally for the non-profit group Jumpstart's early education programs in low-income communities. More than 200,000 copies of Corduroy (in English and Spanish) were donated this past week to at-risk children throughout the US by the Pearson Foundation, the Campaign's National Sponsor and Founding partner, which is headquartered in San Francisco. Nearly half a million people participated nationwide, Pearson officials said. Jumpstart's Read for the Record began early last Thursday with Matt Lauer of NBC's TODAY Show introducing First Lady Laura Bush reading with school children at the White House. TODAY Show interviews with Pearson Foundation President Mark Nieker and Jumpstart President James Cleveland drew attention to the critical issues around early education in America, noting that each year one-third of America's children arrive at their first day of school developmentally behind their peers and without the skills necessary to succeed. Lauer, who along with co-host Meredith Vieira wrote the introduction to the special Read for the Record edition of Corduroy, read to children on Rockefeller Plaza along with Jumpstart Honorary spokesperson LL Cool J, Jesse McCartney, Greg Kinnear, Maria from Sesame Street and Mary-Louise Parker. Children's author and the Library of Congress' National Ambassador for Young People's Literature, Jon Scieszka, helped kick off the day as thousands of reading events took place across the country. In California, readers from every walk of life - elected officials, athletes, reporters, moms and dads, teachers, students, libraries, our military, many celebrities - joined the Campaign, all reading Corduroy to children in both English and Spanish. "This annual event is a wonderful opportunity to remind us all of the importance of reading to our children at an early age," said Dan Pier, Pearson School vice president for California. "Through the Pearson Foundation and the commitment of our employees here in California, we will continue to keep the spotlight on our children and ensure that they have the foundation they need to succeed in reading, in school, and in life." Pearson staffers organized and participated in many of the 100 events at schools, parks, libraries, and shopping malls throughout California. Major reading celebrations were held in San Diego, Los Angeles, Riverside, San Bernardino, Bakersfield, Fresno, Sacramento, and San Francisco. 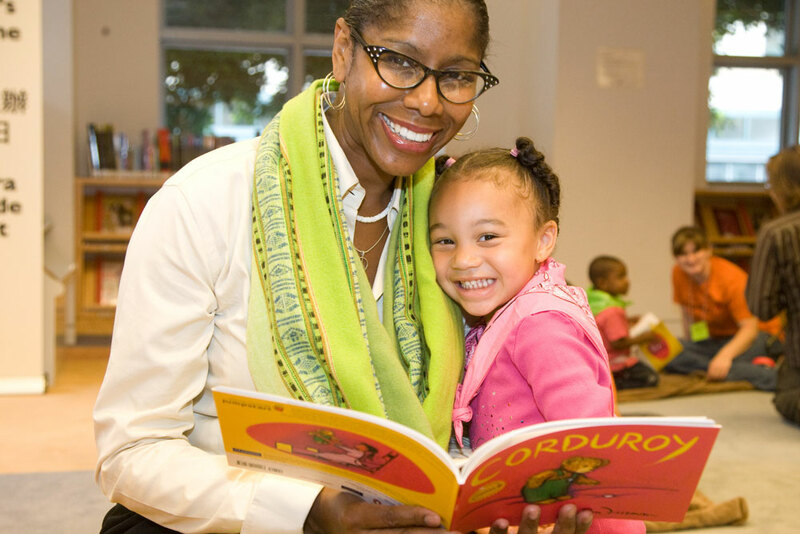 In Los Angeles, Mayor Antonio R. Villaraigosa and Schools Superintendent Darline P. Robles read to children at the Los Angeles Public Library along with numerous celebrities, including Access Hollywood host Shaun Robinson, actress Gabrielle Union, The Hills star Lo Bosworth, and Everybody Hates Chris star Tequan Richmond. Jumpstart and the San Francisco Public Libraries partnered to create events at the city's 29 libraries, while the library's bookmobile delivered nearly 900 books to preschool centers in low-income communities. Entertainer MC Hammer joined Local Supervisors and School Board Members to read to kids at the San Francisco Public Library's main branch. In Sacramento, Pearson School Systems employees and local elected officials brought the program to children at the Shriners' Children's Hospital, and helped organize more than 70 other events throughout the state capital. Pearson Foundation president Mark Nieker said, "Research tells us that children in low-income communities may not even have one book at home while middle and higher-income families often have 50 or more children's books." He added, "Our continued involvement both here in California and across the country is critical for building on the success of the Campaign and helping to raise awareness about this troubling disparity and the importance of reading to children." "Read for the Record is a great launching pad for California to dedicate itself to early learning and embracing new ways to focus on reading success for our children," said Pier. "This is especially critical for California's at-risk children. Pearson School and the Pearson Foundation have dedicated tremendous resources toward developing tools and programs to make sure these children learn to read." He added, "We're already looking to next year's Read for the Record and doubling the number of California's reading events. With the coalitions we are now building across the state, we'll be well on our way to breaking yet another world reading record." Jumpstart is a national nonprofit organization that engages preschool children from low-income communities in an intensive early education program. Jumpstart trains adult mentors, primarily college students, to work in yearlong, one-to-one relationships with at-risk children to improve their language, literacy, and social skills. Since 1993, thousands of Jumpstart mentors have helped more than 50,000 children from low-income communities around the country enter school ready to learn at grade level. For more information, visit http://www.jstart.org. Pearson, the world's leading education publisher, has been providing education materials to California schools as far back as the 1800s. You may know us individually as Scott Foresman, Prentice Hall, Longman, SuccessMaker, NovaNet, Educational Measurement, Educational Assessment, Learning Teams, Achievement Solutions, and so many more - names in the world of education that are recognized and respected across the State and the globe. In fact, most teachers in California have learned their profession by studying with Pearson's Merrill or Allyn & Bacon textbooks, and many have benefited from our professional development programs. Today, nearly a thousand Pearson people are living and working in the State, providing educational materials that cover the gamut from birth through professional learning. Whether in science, math, social studies, music, middle/high school language arts, English as a second language, foreign languages, or AP courses, hundreds of thousands of California's preK-12 students are learning with our Pearson products every day. In addition to Education, Pearson's other major businesses include The Financial Times Group and The Penguin Group. For more information, go to: http://www.californiareading.com or http://www.pearson.com. The Pearson Foundation extends Pearson's commitment to education by partnering with leading nonprofit, civic, and business organizations to provide financial, organizational, and publishing assistance across the globe. The Foundation aims to make a difference by sponsoring innovative educational programs and extending its educational expertise to help in classrooms and in local communities. Pearson is a long-time supporter of Jumpstart. Jumpstart and Pearson were recognized for their collaboration with the 2006 Cause Marketing Halo Award and with Boston Business Journal's 2008 Corporate Philanthropy Award for Education Partner of the Year. For more information, visit http://www.pearsonfoundation.org. With the support of Pearson employees, Jumpstart volunteers, and the San Francisco Library, hundreds of thousands of readers created the world's largest shared reading experience through Jumpstart's Read For the Record on October 2. The book they read was Corduroy by Don Freeman, published by Penguin Young Readers. The Pearson Foundation donated over 100,000 copies of Corduroy to programs around the world in honor of the event. L.A. Mayor Antonio Villagarosa and Shaun Robinson of Access Hollywood read to pre-schoolers at the Los Angeles Public Library on Oct. 2nd as part of Jumpstart's Read For the Record. Hundreds of thousands of readers created the world's largest shared reading experience by reading Corduroy by Don Freeman, published by Penguin Young Readers. Mayor Villagorosa's reading launched a day of reading across Southern California, where the Pearson Foundation donated copies of Corduroy to over 500 pre-school and kindergarten classrooms.